Display in Tiananmen Square during the 2008 Summer Olympic Games. In 2008 as my family and I were heading into the tail end of our year and a half long backpacking trip, we needed an end game. Since we were in Asia, my wife & I decided to see if it was possible to time our visit to China to conincide with the Olympics in Beijing. It had always been a dream of mine to visit the Olympics and attending them in a somewhat closed off country like China was an incredibly exciting prospect! Eventually we were able to secure a Visa which allowed us two different 30 day visits to China. We spent the first month backpacking from Shenzhen all the way up to Mongolia, before leaving and returning to China a few days before the Olympics. During our brief stint in Mongolia we were able to secure three tickets to an archery event, but otherwise we didn’t have accomodations or tickets booked at all. Luckily the Visa process for China is complicated and many of the seats and hotels went empty, especially in the beginning. Over the course of two weeks, we managed to see 9 different events while staying at a local 3 star hotel which cost about $20 a night. It was amazing. I have decided to do something a little different today. Through photos (and a video) I will show you what it was like to be in Beijing during the last few days leading up to the opening ceremony. I will also share some photos from the opening ceremony public viewing party we attended in Beijing. It was amazing. In a second part later on, I will take you through each of the events we were lucky enough to attend. Attending the Olympics in China is still probably my favorite travel memory from visits to more than 70 countries. Please forgive me in advance for the poor quality of the video, however I felt like sharing it was important since it shows you the atmosphere during the Opening Ceremony and how much the crowd cheered for both the U.S. and Chinese teams. Enjoy and please let me know if you like this type of post. The border between China & Mongolia. We were actually detained here while authorities searched my computer as I was suspected of being a journalist. From the border, it was a 12 hour miserable bus ride in this “sleeper” bus. The seats are “flat” and about 4 1/2 feet long. So miserable! We arrived back in Beijing around 3 days before the start of the Olympics. Tiananmen Square was full of police and decorations. Foregin protestors were routinely arrested and deported. Shawn Reece did his best impression of the soldier in Tiananmen Square. The entire country of China could not wait for the Olympics to begin! For the less savvy foreigners, English speaking people were set up in tents on every corner to offer assistance. Everywhere we around the city people had their flags out in support. One of the hutongs or old neighborhoods in Beijing. I’m not sure what this means, but I recognize the rings! Even in alleyways you couldn’t escape the Olympics. They were definitely rolling out the red carpet. The characters in this poster were the mascots! One of the local malls even had our athletes uniforms on display. On the day of the opening ceremony the Olympics loomed large. We were lucky to get a hotel for $20 per night in this local neighborhood. They were selling rooms for $200 per night just two weeks before the games began. When they realized most of the rooms were unfilled, they slashed prices. Even McDonald’s got into the swag game. Finally it was time to head to the park for a public viewing of the opening ceremony. 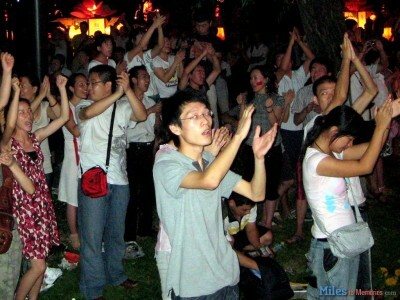 The atmopshere was electric as there were about 4,000 Chinese people and 50 tourists on hand! It was a night that I will never forget. Previous articleChase Freedom Refer a Friend Offer Returns – Act Fast! I’m About to Embark on a Completely New Type of Family Adventure & I’m Excited! P.S. Your son is a cutie pie. You went during the LEAST polluted time as well! Beijing shut all its factories for 6 months to ensure air cleanliness during the Olympics and Paralympics! I had wanted to go to Beijing Olympics as well but my manager was gone one of the two weeks in August and so I had to watch most of it via the internet or TV. However, I did go to the Paralympics. Similar to you, I didn’t have any tickets at all except for wheelchair rugby but upon my arrival, I easily saw where the scalpers were and was able to go to a few more events. The tickets were so cheap that even the scalped prices were affordable! I recall paying a $30 ticket for the Water Cube swimming events (retail value was $12.) I understand Olympics is more expensive than Paralympics but this was my first ever world sporting event and was simply excited to be there! We were actually in Beijing about a month before the Olympics began and the air was so thick you could hardly breathe. By the time we returned for the Olympics things were much better. They turned off the factories about two weeks before the Olympics and like you said kept them offline for quite awhile. It was amazing to see blue skies in Beijing! And yes we bought most of our tickets scalped. Sometimes people just gave us tickets. We spent less than $100 total for 9 events. It was crazy.